I love traveling through small towns. And I especially love stopping at local places to eat. There’s just something about sitting down at a small restaurant, and listening to the conversations that are taking place all around me – conversations about the daily life in a town I’ll never really be a part of. And meeting the people. It’s always fun to meet people on these stops. I’m sure they think it a bit odd when a stranger strikes up a conversation about . . . well, about whatever. Stopping to eat in small towns is the perfect complement for one of my other favorite interests: the Quest for the Best Hamburger in the World. I still think the best hamburger I’ve ever eaten was in one of the most unlikely places – McCaskill, Ark., population 96. 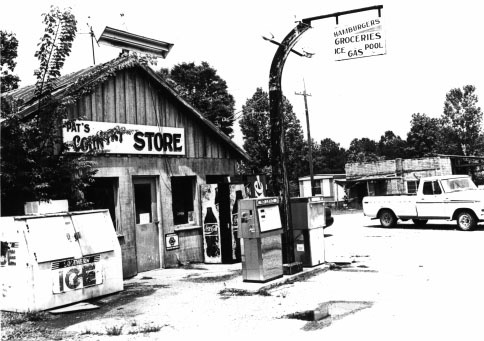 Pat’s Country Store as it appeared in better times in McCaskill, Arkansas. I was working at a newspaper in nearby Nashville, and as I drove through McCaskill on various trips, I noticed Pat’s Country Store. I bet that place, I thought, makes a really good hamburger. On a cold Friday following Thanksgiving in the early 90s, I finally stopped at Pat’s for the first time. I had been visiting my future wife and her family, so I wasn’t really hungry. But once inside, I was struck by the smell of what had to be the best hamburger I had never tasted. Looking around I saw why – an old, black grill that’s worn and charred from the cooking of thousands of burgers over the years. I paid for my grape soda and resumed my journey. Driving down the road, I was tempted to turn back and place an order. I knew I had to have one of those burgers. The question was, when . . . I finally had the chance to try a Pat Burger in 1992. It was everything I knew it would be, and then some – the meat more juicy, the bun, lightly buttered and toasted, and the vegetables fresher. And there was something else. A taste I wasn’t quite familiar with, yet it made the burger what it was. It was some kind of seasoning, which I later found out was Pat’s Secret Sauce. A little over a year later, I was working as a sports editor for a daily paper about an hour away. It was a slow time in sports, high school baseball long over, and football still nothing more than a mirage on the horizon. I decided to write a column on Pat’s burger, which I dubbed “The World’s Greatest.” After getting the words out, I figured that was that. I forgot about the column until a couple of months later when my dad told me he had stopped at Pat’s and finally tried one of those burgers I had bragged so much about. When he placed his order, he noticed a piece of newspaper taped to the wall – it was a copy of my column. Over the next few years, I finally got to know Pat and her husband, Guy. On one of my last trips there, I remember opening the door and being immediately flooded with the familiar sights and smells: the hardwood floor, the wooden and glass cabinets, and, of course, the aroma of cheeseburgers filling the air. Guy came over to shake my hand. “It’s sure good to see you again,” he said. Depending on the day of the week, Guy is either the owner, manager, or employee. “I bet I know just what you want,” said Pat as she took a patty from the refrigerator. “I’ll have you a cheeseburger ready in no time.” It felt good to be back, to be with friends on this hot May afternoon. Back in a familiar place, the kind of place you think will always be there for you to enjoy day after day, year after year. I asked how she was doing. When I heard those words, I knew I had better enjoy this Pat Burger, because there probably wouldn’t be many more in the future. I asked her about the grill that day. Her answer was surprising. “You’re not going to believe where I got that old grill,” Pat said with a smile as she ate one of her cheeseburgers with me. “I bought it from someone in Blevins (6 miles away) who’d junked it. I only paid $100 for it. The three-burner, 36-inch grill stood on my left, cooling off from the day’s activities. It was only 1 p.m., but the grill, and Pat, were through cooking for the day. “I just can’t handle this heat anymore,” said Pat. She and Guy planned to close down for the summer months that year – to relax, travel some, and visit family. But as soon as people in the community learned of those plans, they began to call. Friends who weren’t sure they could live without a Pat Burger for the summer called trying to coax her into staying open. And that didn’t include the people who visited the store each day: some to play pool, some to listen to a song on Guy’s guitar every now and then. But most just come to visit with Pat and Guy. And eat a cheeseburger. There was a small, handwritten sign at the back of the store, weathered and wrinkled with age, that simply read, Pool lessons, $5 an hour by Guy. Call for Apt. I wasn’t sure if Guy still taught pool. I started to ask, then decided against it. Reluctantly, I put the last bit of hamburger in my mouth. It tastes as good as the first. I immediately want another one, but by the look on Pat’s face, I know better than to ask. She looks as tired as she’s told me, but I know she would cook that second burger for me if I asked. She wipes away a bead of sweat as she finishes off her lunch. “I’m not going to retire retire,” she stressed. “We’re going to open back up. I love to cook too much to close down for good.” But even as the words left her mouth, I knew I’d eaten one of my last hamburgers at Pat’s Country Store. I had two or three more burgers at Pat’s before she closed down for good. Today, Pat’s Country Store stands abandoned, a shell of what was once a favorite hangout for neighbors in friends in the community. As I drive by, the sight of the former store makes me sad. I realize that it wasn’t the black grill that made that cheeseburger special. And it wasn’t the special sauce. What made Pat’s burger special was Pat and Guy. Without them, the store was nothing more than a rusty metal building with hard, cement floors. And a black grill, junked once again, that stands alone in the back of a dilapidated building in the tiny town of McCaskill. Great story! Makes me want a hamburger! Thank you. I’m so glad you enjoyed it!